The Mercedes-Benz GLC goes on sale in mid-November. STUTTGART -- Mercedes-Benz will offer a coupe version of its up-sized second-generation compact crossover, with plug-in hybrid and performance variants coming, as well. The 2016 GLC unveiled here last week goes on sale in mid-November. It replaces the GLK. Mercedes executives confirmed that a coupe version of the GLC -- similar in styling to the new larger GLE Coupe -- will go on sale next year. Dieter Zetsche, CEO of parent Daimler, announced the GLC will be offered as a plug-in hybrid, "for the first time in this segment." The hybrid will be called the GLC 350e. Mercedes also will offer the GLC 450 AMG -- a sportier model tuned by AMG but not a full-blown high-performance version. There is no GLK AMG variant. To emphasize the GLC's sleeker styling, Mercedes launched the second generation at the headquarters of German design house Hugo Boss. Thomas Weber, Mercedes board member for r&d, said the GLC will be the first crossover in its segment to be available with semiautonomous driving features -- which should give the vehicle an edge against the competition. The GLC has increased active- and passive-safety features trickled down from the sedans, an air suspension and driver-selected settings for performance and handling. The electric and gasoline powertrain on the hybrid will have a combined 320 hp and an electric-only range of about 34km (21 miles). Kaellenius: U.S., China will be main markets. Zetsche did not give specific sales forecasts for the GLC but said Mercedes has sold 650,000 GLKs worldwide since its launch in 2008. It will also be offered for the first time in right-hand drive, which should increase GLC sales in "the double-digits," compared with its predecessor, said Ola Kaellenius, Mercedes board member for sales and marketing. The U.S. and China will be the biggest markets for the GLC. Which market will be No. 1 "is a toss-up," Kaellenius said. Like its sister C-class sedan, the five-seat GLC moves up in size and features. It is no longer Mercedes' entry crossover because of the addition of the GLA crossover last fall. There is more interior space, especially in the rear. The GLK has a boxy shape, making it a smaller version of the G-class SUV. The GLC is sleeker and more modern looking with flowing lines. 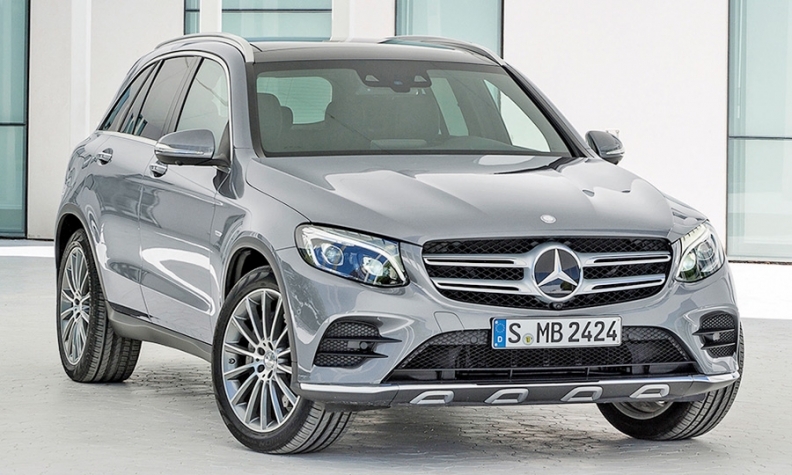 The GLC is 4648mm (183 inches) long, up from the GLK's 4529mm (178.3 inches). Height is nearly the same, at 1701mm (67 inches). Width increases by nearly 51mm (2 inches) to 1935mm (76.2 inches). The GLC is longer than the rival Audi Q5, which is 4638mm (182.6 inches). Despite the larger dimensions, the GLC weighs 80 kilograms (176 pounds) less than the GLK because of extensive use of aluminum and high- to ultrahigh-strength steels. Almost all of the driver-assistance systems have come from the C-, E- and S-class cars as standard or optional. This includes the Intelligent Drive system with collision prevention and crosswind stabilization as standard. The GLC also gets a keyless start system, touchpad control for climate and entertainment, a rearview camera, power tailgate and power driver seats. Inside, a 7-inch color screen and media interface for phones and iPods is standard.